Glass hurricane globes are commonly used to protect candles or oil lamps from the wind, thus the name. 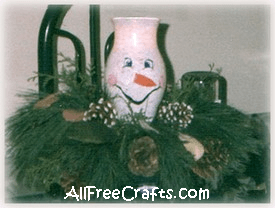 In this craft project, you will use a hurricane glass to make a lighted snowman centerpiece that looks lovely surrounded by a little Christmas greenery. Clean the hurricane globe thoroughly with a glass cleaner or dish soap and dry completely before applying paint. On a paper plate, pour grey paint in a circle and immediately beside the grey, pour an equal amount of white paint. Dip your sea sponge into the paint, making sure both colours adhere to the sponge. Dab gently over the entire outside of the globe with this mixture, adding more paint to your sponge as recquired. Leave some areas unpainted (small dots) on the globe to allow the light to sparkle through. Allow this paint to dry completely. Once your paint is dry, begin painting the face. Starting with the eyes, and referring to the photo at right, paint the outline of your eyes with black paint, paint the centre with blue and add a small line of white and a couple of dots to the blue painted area. Paint the nose to form a carrot shape and outline with a very fine line of black paint and add a few little lines for wrinkles in the carrot. Paint the mouth as shown with black paint. To add the rosy cheeks, use a very damp and very small piece of sea sponge dipped in red paint with most of the red paint removed on a paper towel. Dab a very light circle with the sea sponge for the cheeks. You can use the painted snowman hurricane glass in a centerpiece, as shown, surrounded by some branches of Christmas greenery and pine cones. Light the hurricane globe with a real or battery-powered candle. As always, never leave a lit candle unattended. If desired, nestle a short strand of Christmas lights in amongst the greenery for even more festive illumination.